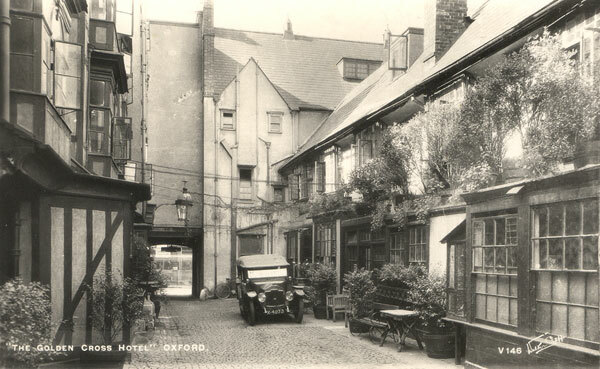 The above print shows the Angel Hotel, Oxford’s most important coaching inn, in the 1820s. The coach on the left is labelled Oxford / Cheltenham / London. 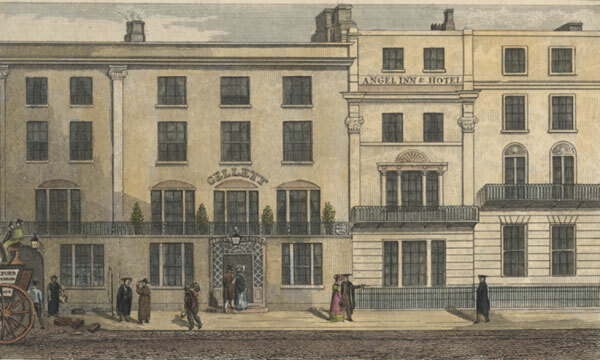 There is an indistinct old sign behind the lamp over the main door reading INN ANGELL, while the name Gellett at first-floor level is that of Thomas Gellett, whom Pigot’s Directory lists as innkeeper in 1823. There was an inn called the Tabard on this site as early as 1391. It was renamed the Angel in 1510, and was mostly rebuilt in 1663. It must have suffered a drop in trade with the coming of the railways and closed in 1865. It was then converted into shops, most of which were demolished in 1876 to make way for the Examination Schools. 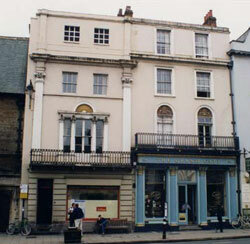 The Clarendon Hotel occupied what is now the Cornmarket frontage of the Clarendon Centre. It was an ancient coaching inn, known as the Star for its first 400 years of life. Its front was replaced in 1783. In 1863 the Star was acquired by the Clarendon Hotel Company and renamed the Clarendon Hotel. 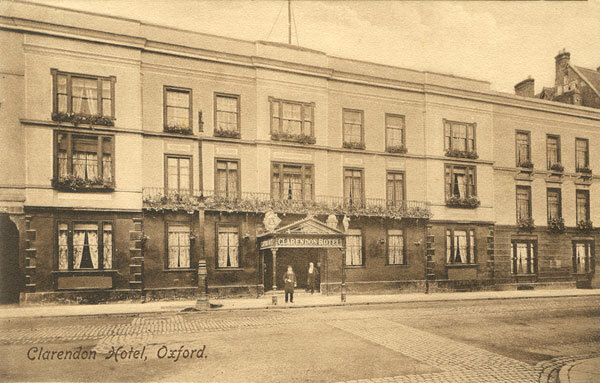 In 1939 the hotel building was bought by Woolworth & Co. and was demolished in 1954 to make way for their new store, which in turn became Littlewood’s and was then demolished when the Clarendon Centre was built in 1983/4. 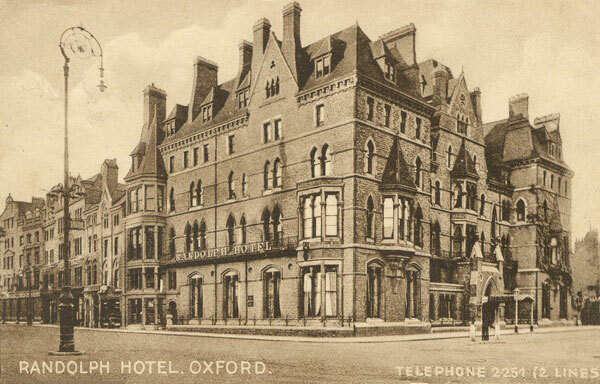 The Randolph Hotel in Beaumont Street was built between 1863 and 1866 by William Wilkinson, and is named after the Randolph Gallery (now the Ashmolean Museum) on the opposite side of the road. A detailed description of the new building is given in Jackson's Oxford Journal of 15 October 1864. … a first-class Hotel for families and gentlemen…. It contains many handsome suites of rooms with very charming prospects. It is fitted with an American elevator, and is supplied throughout with Electric Lighting. An omnibus meets all the most important trains. Carriages and horses can be obtained from the Randolph Stables adjoing the Hotel; there is also a large garage attached. The Roebuck Inn (so named in 1610 after the arms of Jesus College) originally faced Market Street, but by 1740, when it had become a large coaching inn on the London to Gloucester run, its yard and main entrance faced on to Cornmarket Street. 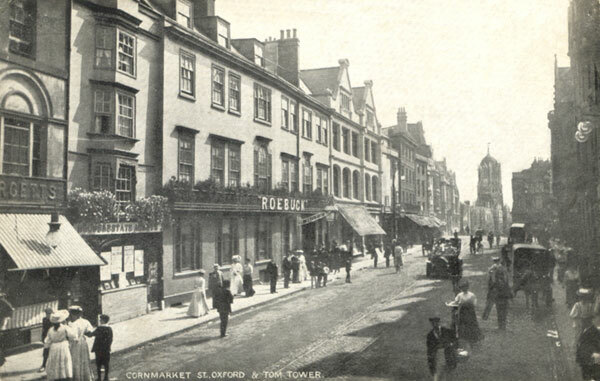 In 1850 it was rebuilt as a new hotel to rival the Star on the opposite side of Cornmarket, and in 1865 the coaching office together with an ostler’s house and Chaundy’s cigar shop were demolished so that the Roebuck Vaults could be built in Market Street as a tap to the main inn. In 1924, the Roebuck Hotel was taken over by Woolworths, who later moved across the road and demolished the Clarendon Hotel. In 1938 the old vaults were rebuilt and renamed the Roebuck. Boots PLC occupy the site of the former coaching inn.